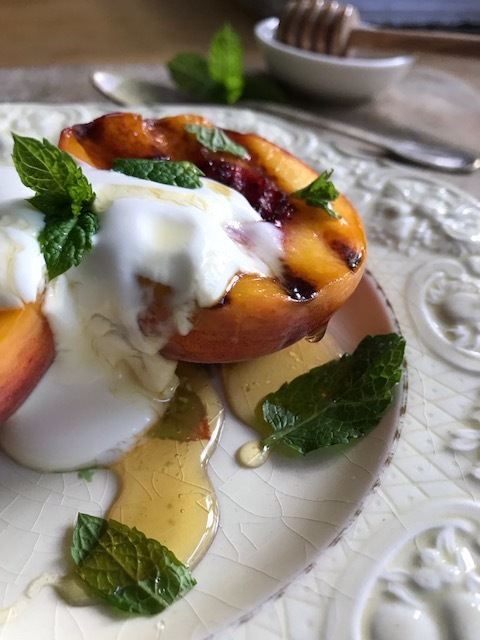 If like me you’re hanging on to summer by your finger tips then this is the perfect little treat to celebrate the end of the juicy peach season. Unless it’s a hot day I doubt I would pick up a peach ( is it just me or are they not as juicy and delicious as they were years ago?! ) I love eating them like this and the variations are endless! It’s a great stress free dinner party dessert and depending on what you have available a sprinkle of chopped hazelnuts or pistachios is a great addition. Works just as well with ice cream or double cream too. You could completely swap it out and turn it into a tasty and impressive starter served with blue cheese, prosciutto and rocket. Both look very pretty once plated up. 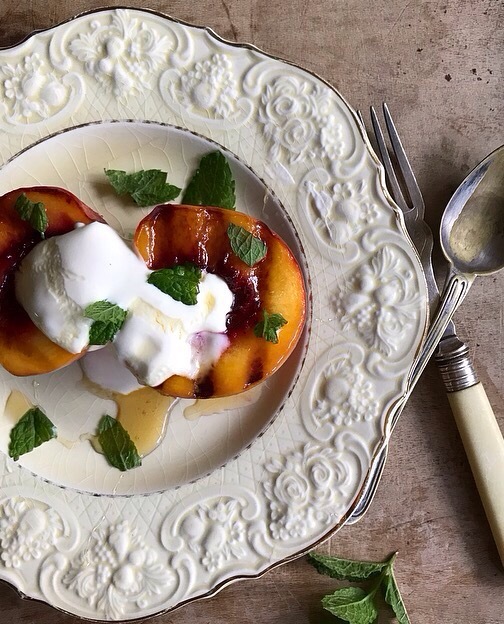 It takes minutes to prep, which involves cutting your peaches in half removing the stones and getting your griddle pan very hot, then you’re good to go! This really is a great recipe to have up your sleeve! 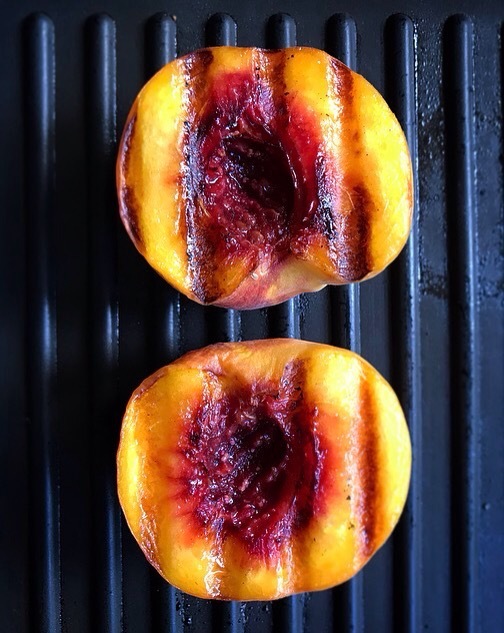 Get you griddle pan on high to heat up while you cut and de-stone your peaches. Brush them lightly with olive oil. Once the pan is hot place the peaches cut side down, I press them down lightly to ensure contact. Keep an eye on them because depending on how ripe your peaches are they can get the wonderful scorch marks very quickly. Then when you’re happy turn them for a few seconds again depending on the ripeness. That’s it!! Plate up and top with your choice of yogurt etc. It’s nice to put the nuts on the table for guests to help them selves. 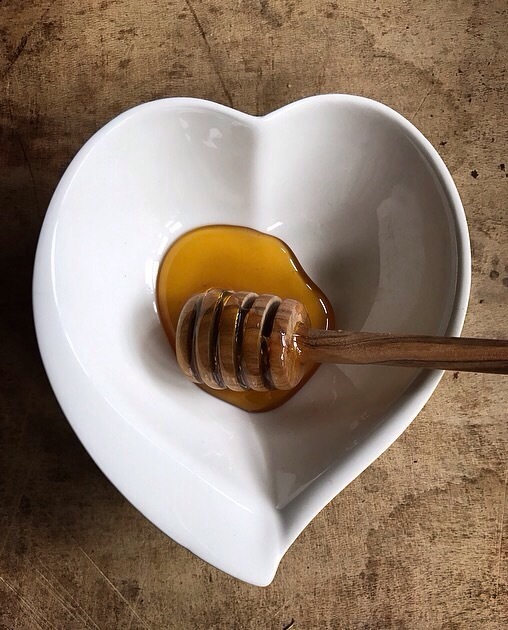 Drizzle with honey and sprinkle with the torn mint. et voila …. Delicious with a dessert wine!